College of Sciences Dean Paul Goldbart has accepted a position as the Dean of the College of Natural Sciences at the University of Texas at Austin. 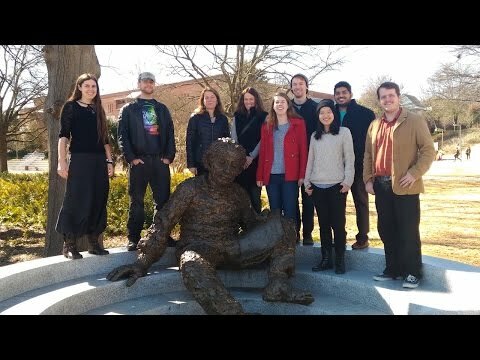 In this first installment of a two-part audio story, Goldbart looks back on his time at Georgia Tech, which included exciting growth in research in astrobiology, microbial ecology, and gravitational-wave astronomy, as well as the exhilirating experience of the eclipse on Aug. 21, 2017. The evolution of the ribosome, illustrating growth of the large (LSU) and small (SSU) subunits, first as separate units and eventually as parts of a whole. Why are Gravitational Waves So Important? New degree programs. More undergraduate admissions. Participation in Nobel Prize-winning research. A Tech Green solar eclipse watch party. Paul Goldbart's five years as the Dean of the College of Sciences were highlighted by changes, growth, community-building, and opportunities. Goldbart, the College's Betsy Middleton and John Clark Sutherland Chair, talks about his time at Georgia Tech in this first installment of a two-part audio story that also serves as a preview for the forthcoming College of Sciences podcast, ScienceMatters. This audio story is hosted and produced by College of Sciences Communications Officer Renay San Miguel. You can listen to the story by clicking on the image link to the right, or you can read the transcript below. Part 2 will be available on May 16, 2018. If you want to know more about ScienceMatters, click here. Renay San Miguel: Hello. I’m Renay San Miguel with the Georgia Tech College of Sciences. By now, you may have learned that College of Sciences Dean Paul Goldbart has accepted a position to be the next dean of the College of Natural Sciences in the University of Texas at Austin. The Lone Star State’s gain is our loss. We are sad to see Paul go, and we thank him for his extraordinary service to the College of Sciences and to Georgia Tech. I interviewed Paul in early 2018 for the premier episode of the College of Sciences’ podcast called “ScienceMatters.” With the new appointment in Texas, however, we’ve recast the interview into a two-part audio story to serve as a valedictory for Paul, as well as a preview of “ScienceMatters,” which will begin broadcasting later in 2018. 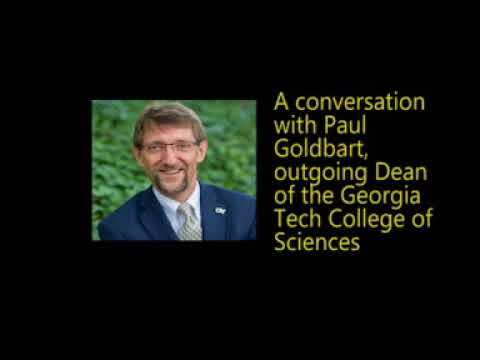 Here is Dean Paul Goldbart in his own words, and you can hear him as both engaging physics professor and forward-thinking administrator as he charts opportunities for growth of the Georgia Tech College of Sciences, and recalls the highlights of his tenure. Paul Goldbart: So let me begin with astrobiology. Once upon a time, that title sounded like a crank science. It’s really moved to center stage now, incredibly exciting. So we have folks really thinking about how to search for life in space and in time, looking out into the cosmos. Wouldn’t it be remarkable to find out where our neighboring colonies of life are? And we have communities looking at that from the aspects of biology and chemistry, from Earth and atmospheric sciences, and physics. We have people thinking about exoplanets, how you find and discover the properties of planets orbiting other stars. So tremendous range and tremendous interdisciplinarity. We also have folks who are looking back in time. How did life start here on Earth? Wonderful activities in chemistry, Earth and atmospheric science and biology, looking at this tiny, thin sliver of a shell of life here on our remarkable planet, and people essentially doing the archaeology of the oceans: What was the chemical composition of the oceans back in time? Was there enough oxygen to sustain life? Folks working on that kind of really fundamental and incredibly exciting question. So astrobiology is really central, and we have a thriving community. And it reaches out well beyond the College of Sciences—interacting with folks in the Ivan Allen College of the Humanities—wonderful community there and elsewhere on campus, too. So delighted to see that here at Georgia Tech. Let me turn to another area in the life sciences that I’m very excited about: the area of microbial ecology. There are microbes everywhere, all around us, and we live in this, hopefully, symbiotic relationship with them. And the study of microbial ecology is really taking shape quite wonderfully here with an emerging community of people from biological sciences, from chemistry, and from physics. And this subject needs tools all the way from genetics and biology, through game theory, physics and mathematics, all the way into medicine. So just to give you a flavor of the subject how microbes, and then microbial infections, infect us, harm us, is really a question of the shape and structure of the colonies that they form. And so physicists are teaming up with biologists to understand the kind of materials that form through microbial infections. And this is taking us all the way from basic science through to wound care and all the way to healthcare and cystic fibrosis. So I must say, from my perspective, it’s incredibly exciting to see science, both at the fundamental level, but also reaching out into the community. Renay San Miguel: And so many applications for what is being researched here. You know, as we have this conversation, we’re going through one of the worst flu epidemics that the country has seen in a long time and—but there are so many things that this would be applied to, you know, to warfare and treating wounds in battlefield, things like that. It’s just very exciting research. Paul Goldbart: That’s right. And healthcare within hospitals — microbial infections arise in hospitals at an enormous rate. And so what’s so exciting is to look at this long arc of history and feel that we are the tip of the sphere and that the sphere, currently, in developing new knowledge and understanding to inform the healthcare of the future, and that’s a remarkable, remarkable place to be. Renay San Miguel: Let’s talk about the eclipse. Renay San Miguel: On August 21st, 2017, the first day of classes, thousands of members of the Georgia Tech community descended on Tech Green to watch the moon’s shadow cover 97 percent of the afternoon sun. Georgia Tech student: I will always remember this because I saw the eclipse and started college on the same day at the best university. Paul Goldbart: College of Sciences along with the Provost’s office put together a quite exquisite array of activities. Those of you who live in the Southeast might know of Woodstock, Georgia. This was a different kind of Woodstock. This was a remarkable event on campus. We had thousands and thousands of people coming together, congregating, all inspired by an eclipse. And eclipses, of course, go back in history and they’ve had quite interesting sociological impacts ushering in new eras and so forth. And so to watch our community come and react—our community of scientists and mathematicians and technologists and engineers and others come together, but react in this wonderfully human way and enjoy this remarkable astronomical event was really wonderful. And so just to see the community out there with this festival atmosphere was great. And the only concern, really, is what are we going to do next year? Really, it was a marvelous time. Renay San Miguel: Tell me about gravitational waves. I mean the idea of the institute and some of the faculty and the researchers and students here involved in what would eventually be a Nobel Prize-winning effort had to be just so pleasing for you. Paul Goldbart: Well this is very exciting. 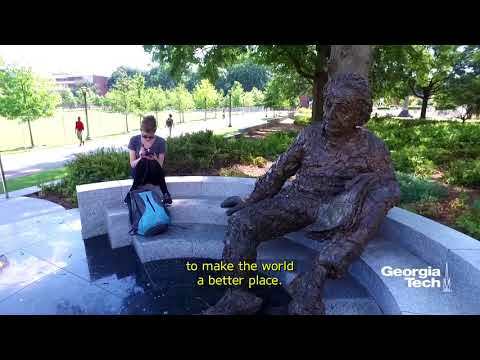 So I’ve been at Georgia Tech for about seven years, and astrophysics was launched here a little bit before I arrived and has really taken root quite beautifully with wonderful leadership initially from Pablo Laguna and now from Deidre Shoemaker. But let me tell you a little bit about the story because the story really goes back now a little bit over 100 years: Albert Einstein has put together his masterpiece theory of what’s called “general relativity,” which is really the first successful post-Newtonian understanding of gravity. And the remarkable shift in thinking that came about with Einstein in 1915 was the idea that space and time, themselves, have a kind of pliability or elasticity to them; they’re not just a rigid stage on which the history of the universe unfolds. But, they are, in their motions and changes, part of that story; they are actually actors, not just the stage. And one of the predictions goes something like this: You may know that if you shake an electrical charge, out comes electromagnetic radiation. That, for example, is how when you heat an atom, it puffs off a little bit of light; that’s where we get the yellow of sodium lamps, for example. So shaking, charges. Electrical charges cause a ripple in the electromagnetic field that propagates outward, and that’s what we call light or, in other frequencies, different forms of radiation like X-rays or infrared radiation, just to give two examples. After Einstein in 1915, we understood that the same kind of thing happens with mass. If you shake some mass somewhere in the universe, that mass actually causes a ripple. But now the ripple is not in the electromagnetic field, but it’s in space and time—the actual geometry of space and time themselves—and that ripple propagates out, and it takes a certain amount of time to arrive at a distance. So, for example, if the sun were to magically disappear, we wouldn’t know it for the eight or so minutes that it would take for the gravitational field to change and respond to a new configuration, the one that would be there in the absence of the sun, at which time the planet, Earth, would fly off in a kind of tangential trajectory rather than its almost circular orbit. So the basic idea is that masses, when they move and they accelerate, they can give rise to a rippling in space and time that propagates like a wave, like the ripples that you find on the surface of a pond when you throw a stone in. The tough part of the story is that space and time are remarkably stiff, and so it takes very big masses to have a perceptible, measurable impact. And where can you find big masses accelerating quickly? Well, you can find them in the mergers of black holes. So I remind you that black holes are stars that have collapsed under gravity so much so, that not even light, essentially, not even light can escape from them; that’s why they’re black. They’re very, very dense objects. And they can come, occasionally, in pairs and they orbit around one another in the same way, roughly speaking, that the moon orbits around the Earth. Now what happens is that these two black holes are moving around one another and, because of this idea of space and time having a kind of elasticity to them, that binary black hole system radiates out energy in the form of gravitational waves. And just a little bit like the yolks of two eggs frying in a frying pan, they move around one another and, eventually, in this cataclysmic event, they merge into a single yolk. Here, they merge into a single black hole, and as they do, they give out an astonishing amount of energy in the form of gravitational radiation which then propagates through the cosmos and that’s the way it goes—until LIGO. And LIGO is this experiment, this collaboration—roughly 1,000 people working hand-in-glove, two stations: Hanford, Washington, and Livingston, Louisiana, and there are experiments at both sites. And the reason there are two sites is that you want to understand coincidence. If a gravitational wave passes through one and then passes through the other, you know far they are apart and you know how long that ought to take, and you can really have a chance of finding the needle in the proverbial haystack of these very, very small signals. So the experiment has been in the making for several decades, fantastic support from the federal government even though this is an incredibly challenging experiment to undertake, and I applaud the citizens of the United States for supporting this really heroic endeavor which, I think, is as much part of culture as it is a part of technology and science. So the experiment goes like this: You have to detect this wave coming through. And what does the wave do? Well, it changes the shape of space and time, but it does so at a very small level. And just to give you a sense of the smallness of the changes that have to be detected, let me ask you to look at your pinkie. Look at your little finger and ask, how broad is the nail? Well, roughly speaking, it’s about a centimeter across, something like that. Now shrink down by about 8 powers of 10—so about 100 million— and that gets you to about the size of an atom—not enough. Now go down by another 8 powers of 10. That gets you to about the size of a nucleus of an atom, but smaller: about a thousandth of the size of the nucleus of an atom. And that is the distance, or change in separation, between the detectors of the experiment in an evacuated tube about four kilometers long—one in Louisiana, one in Washington—that needed to be detected. Quite a challenge. I’m told that it’s as if we knew the distance from Earth to the nearest star to within the thickness of a human hair. Paul Goldbart: I haven’t checked that calculation but it sounds a bit right to me. Quite a challenge. And this, nevertheless, was accomplished. Not only was it accomplished, but it was accomplished the day after the experiment was turned on — 20 years in the making. And it’s as if nature had conspired to send us this perfect signal. Renay San Miguel: It was just waiting for us to build these instruments. Paul Goldbart: Exactly. “Are you ready? Are you ready?” [Laughter] So to give you a sense of scale, the gravitational event, the merger of two black holes that was detected about two and a half years ago, and that wave has been propagating through space, waiting, [laughter] and arriving here at Earth to be detected. Now, since then—and we say in science sometimes “Yesterday’s sensation, today’s calibration”—that event is one of several that have now been detected; it’s raining black hole mergers out there. And the most recent event, another truly stunning event much closer to Earth, was the signature of the collision—not now of two black holes, but of two neutron stars. Renay San Miguel: And that particular celestial collision would result in another major breakthrough for College of Science researchers. That, along with Paul Goldbart’s vision for the future of the College of Sciences, is coming up in Part 2 of this audio story. I’m Renay San Miguel with the Georgia Tech College of Sciences.